The Ascent movement is a movement for Christian men and women in their middle and late years, and was founded in France in 1951 by a retired priest. The aim of an Ascent group is to show that our tasks as Christians are never over. Pope John Paul II has said “There is no retirement age for the Christian”. For the physically active, there are a whole host of things to do, in the family, the parish, the community – working for the Church, working for the world according to their own God-given gifts and their present strength and ability. Even if housebound or bedridden, all must be helped and encouraged to see that the many long hours spent on their own can be used fruitfully in prayer. Their prayers are invaluable and, as they have more time, their vocation is to deepen and develop their prayer life. We meet to pray and deepen our understanding of the Gospel to discover Christ’s message for us at this stage in life by sharing our experiences, joys and sorrows. We also meet with Ascent Groups in Parishes throughout the country for retreats, conferences and celebrations. At various times during the year, the Sisters of Sion arrange ‘Lectio Divina’ meetings. The times of these are published in the Newsletter. These groups were set up as part of the Millennium preparations and a number continue today meeting for six weeks during Lent and in the run up to Advent each year. The groups follow a programme of guided bible study, reflection and prayer which is supplied by the diocese. For details of when the groups meet, keep an eye on the Newsletter. The group meets after the evening Mass on the last Sunday of each month. It was founded in 1995 by a group of young adults in the parish who spent some time reflecting in Walsingham. Some of the original group still attend meetings along with parishioners, Sisters and friends. All are welcome. The meeting consists of reflection on some aspect of Padre Pio’s life and work, recitation of the rosary and prayers of intercession. 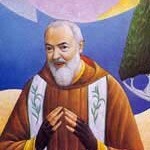 Padre Pio was born on 25th May 1887 in Petriecela, Southern Italy. He entered the Capuchin noviciate at the age of 15 and was ordained to the priesthood in 1910. On 20th September 1918, the five wounds of Christ’s Passion appeared on his body, making him the first stigmatised priest in the Church’s history. He suffered for 50 years and died on 23rd September 1968. Padre Pio himself founded the groups in order to pray for our Holy Father and the Church. His influence is truly remarkable and he was declared venerable by Pope John Paul II.